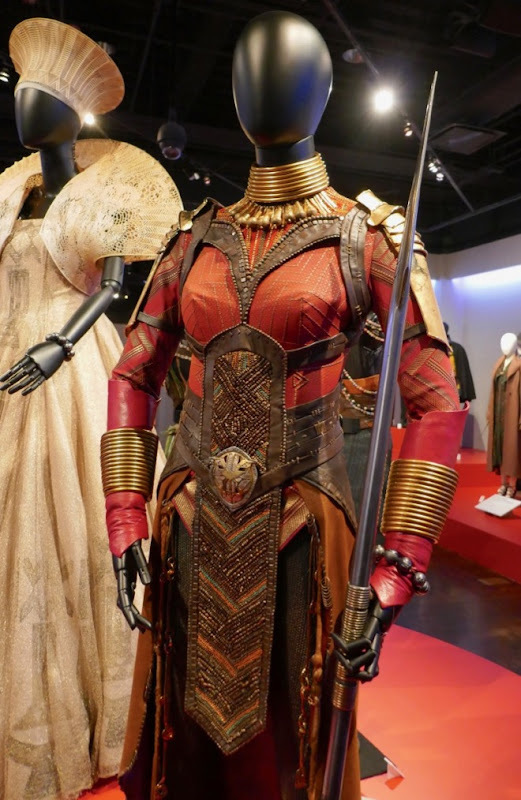 Congratulations to Ruth E. Carter for her historic Academy Award win for Achievement in Costume Design for Marvel Studios Black Panther. 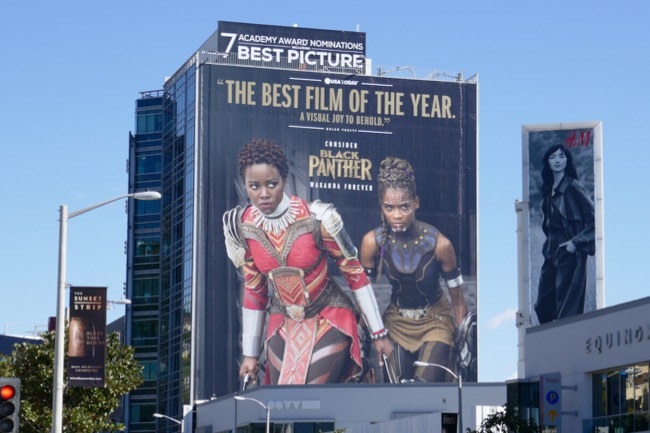 This is her first win after two previous Oscar nominations for Armistad and Malcom X and she is the first African-American woman to win in this category ever. 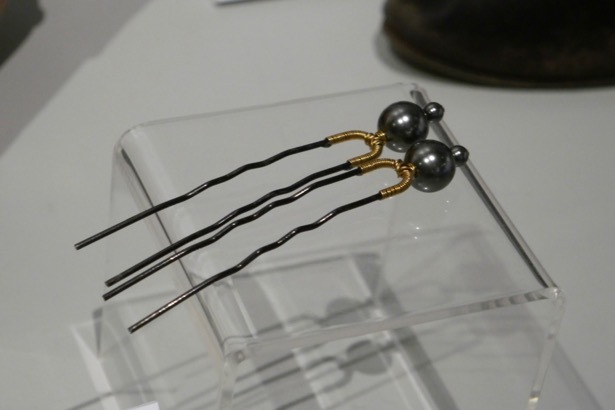 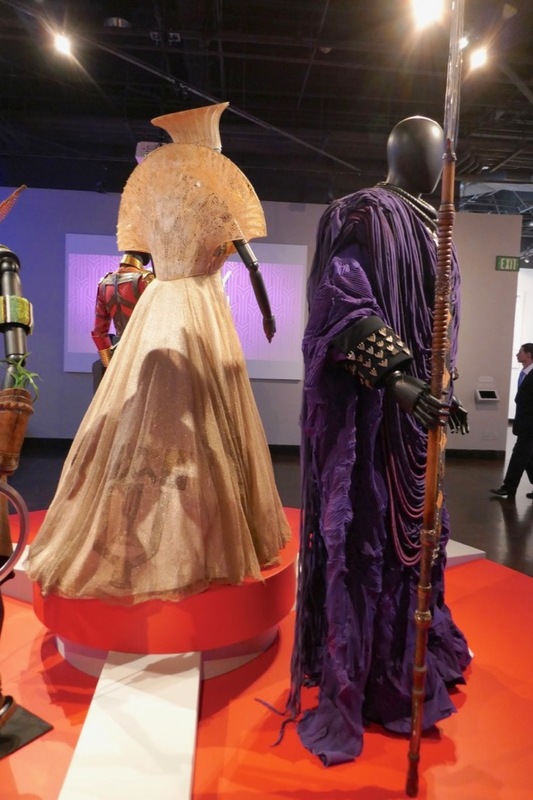 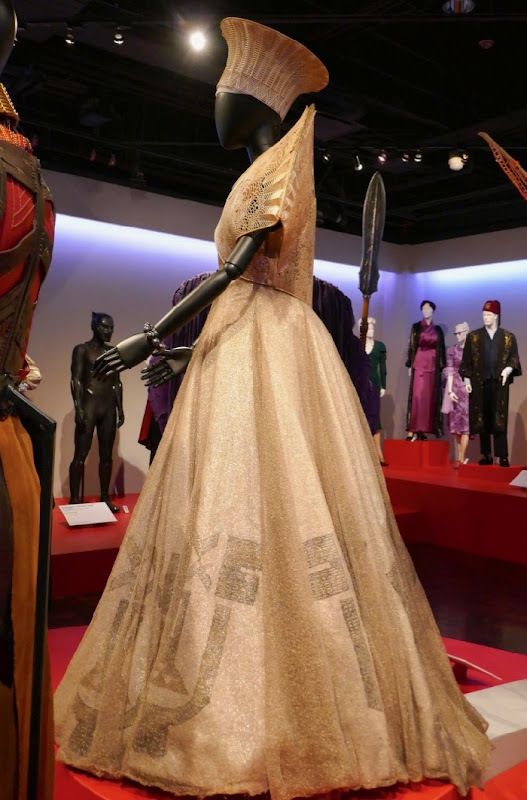 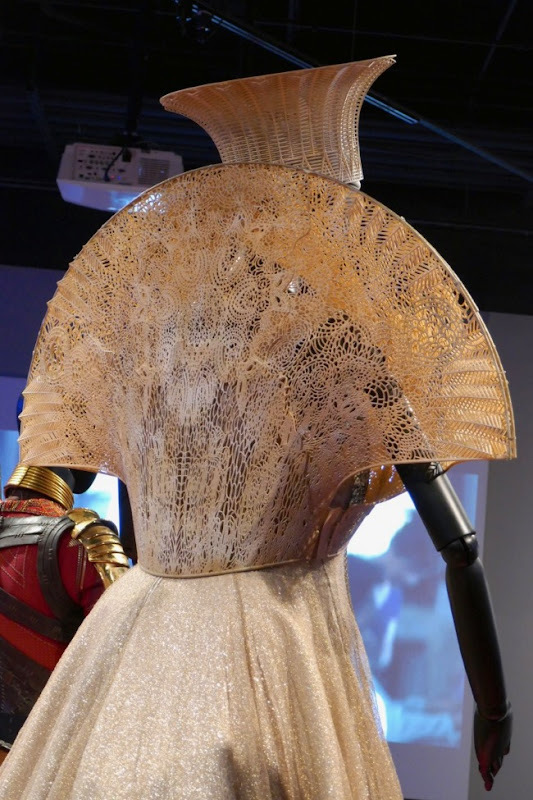 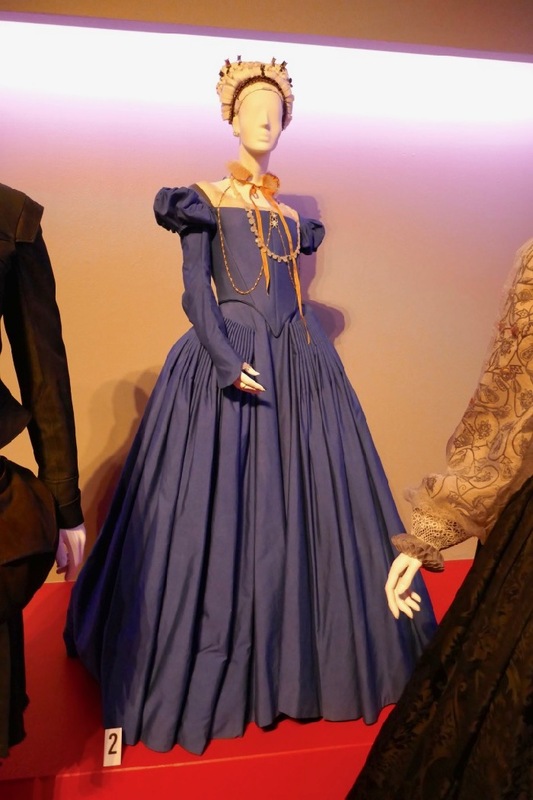 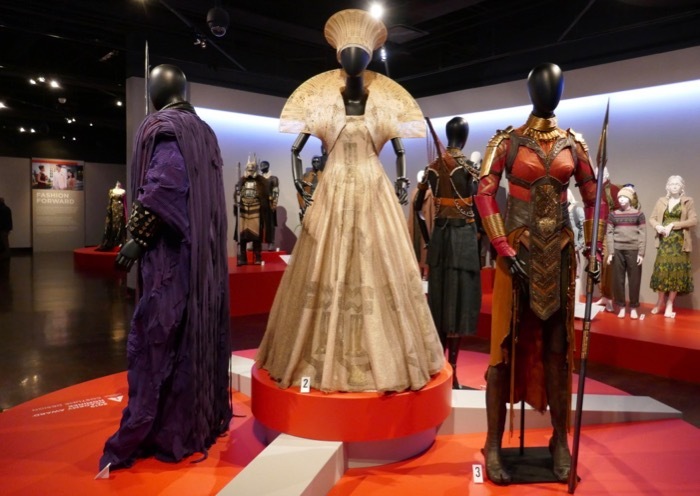 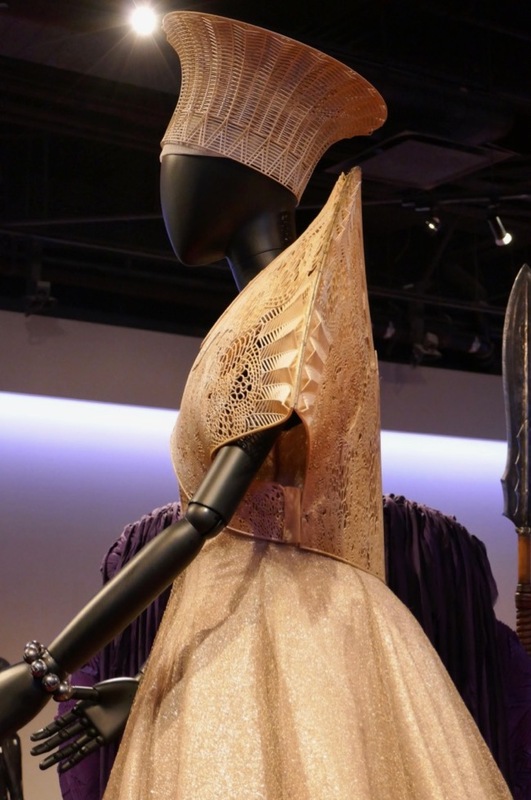 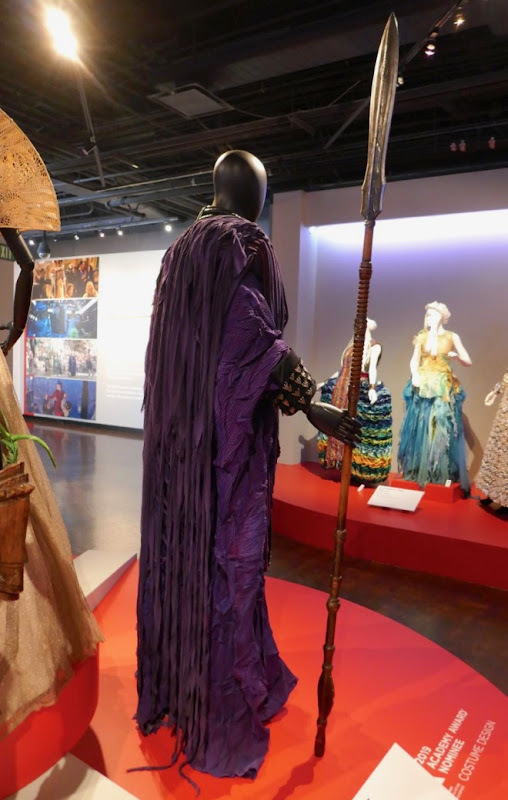 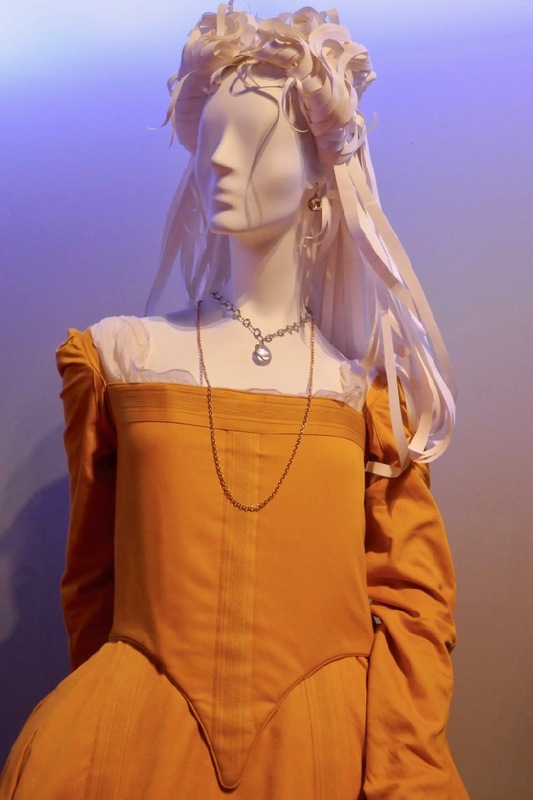 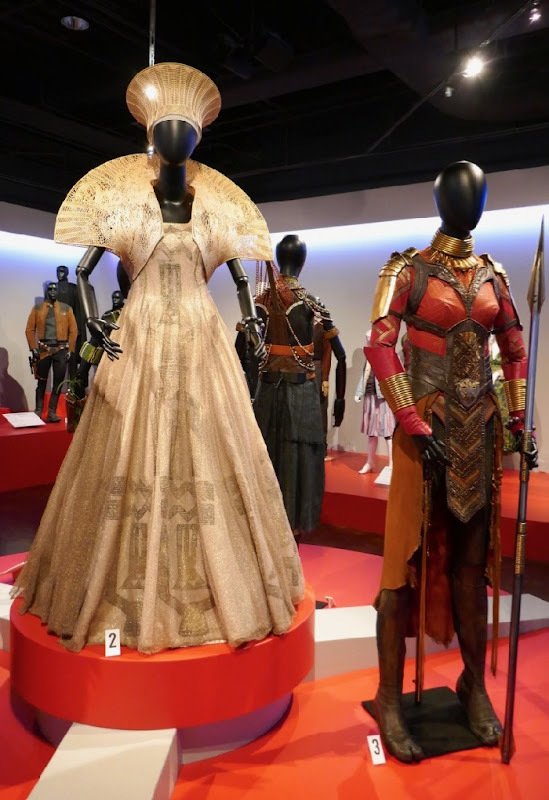 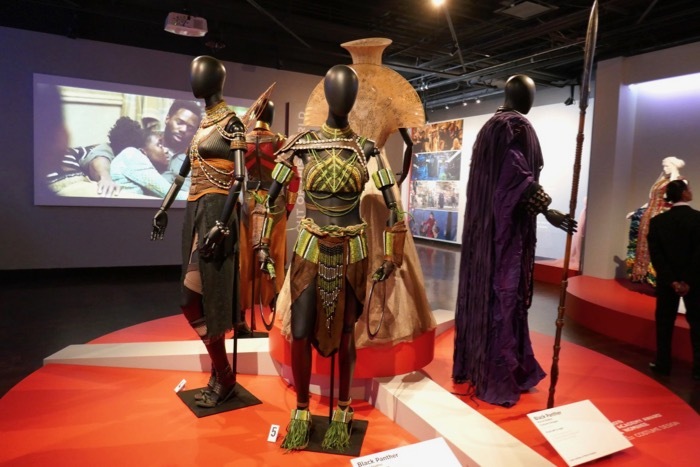 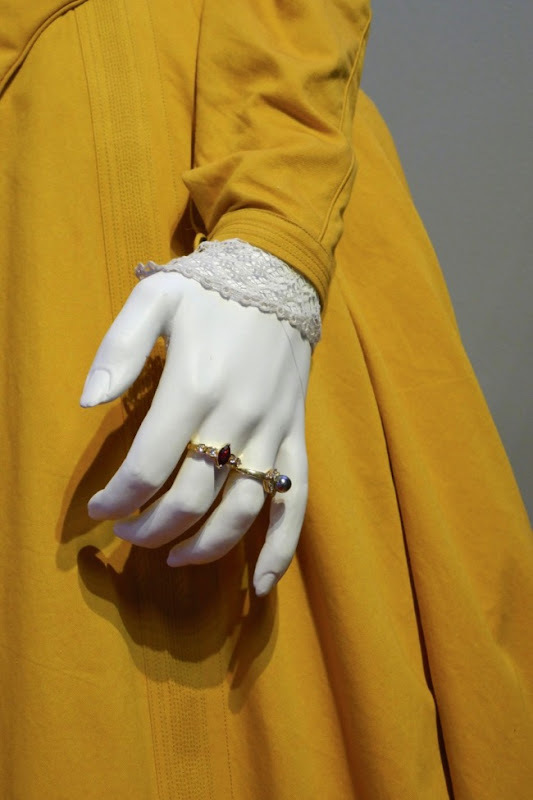 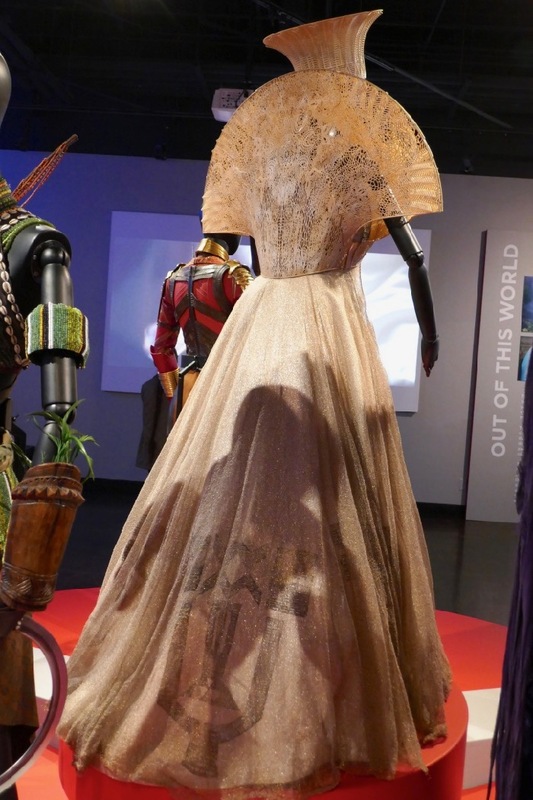 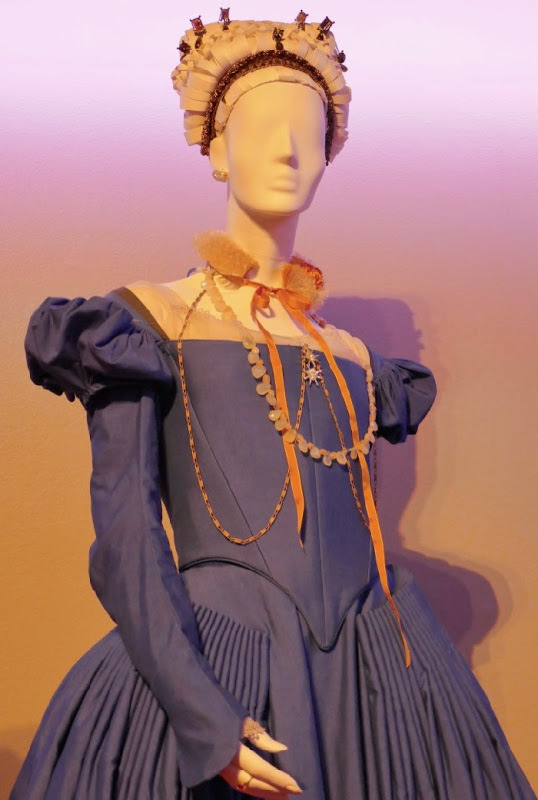 This Oscar-winning exhibit was presented at Downtown L.A.'s FIDM Museum and photographed as part of their 27th Art of Motion Picture Costume Design exhibition on February 5, 2019. 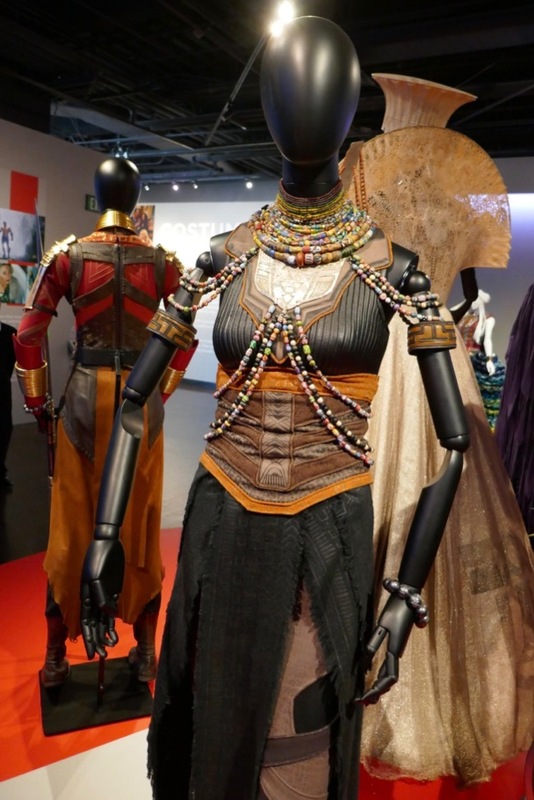 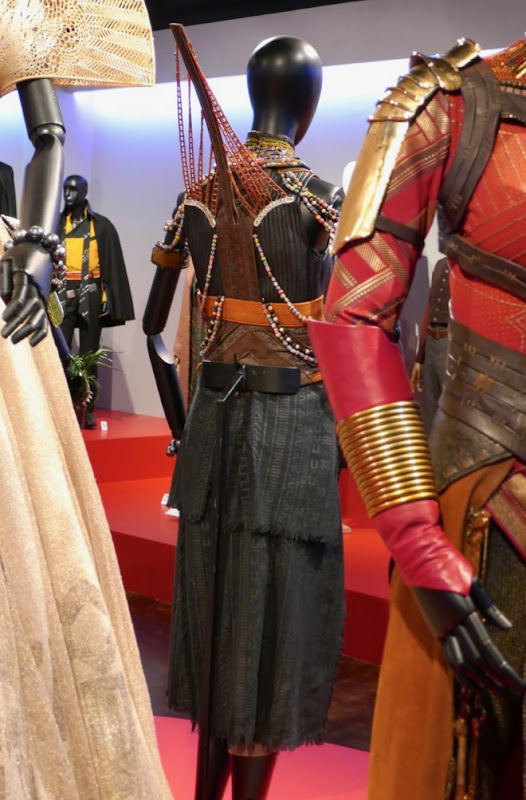 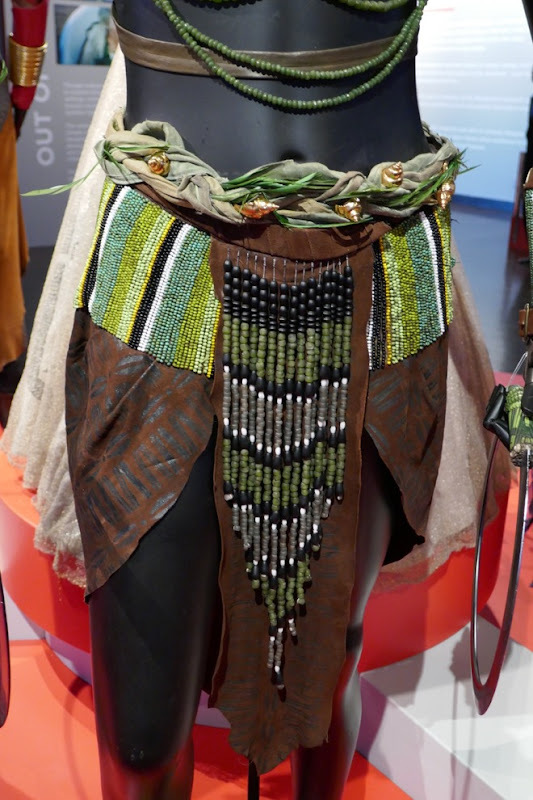 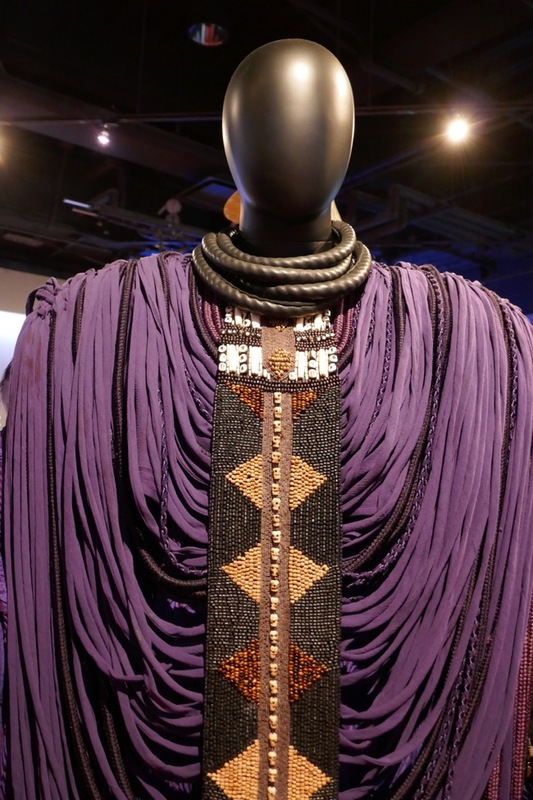 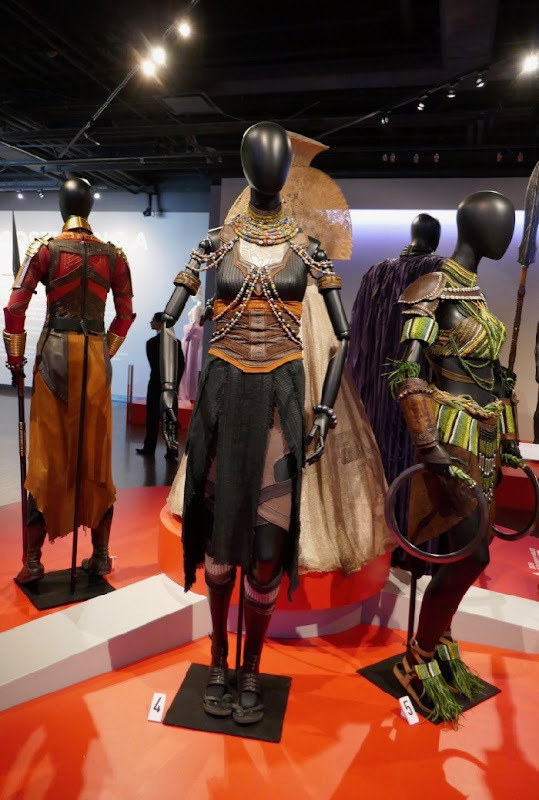 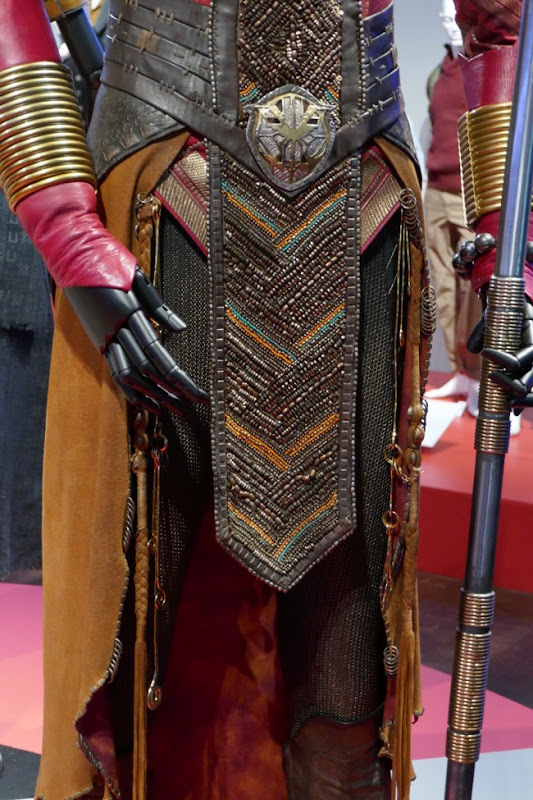 These Afrofuturistic costumes from the Black Panther solo movie draw their inspiration from many African styles, cultures and heritage, plus and also the technology-advanced nature of the hidden nation of fictional Wakanda. 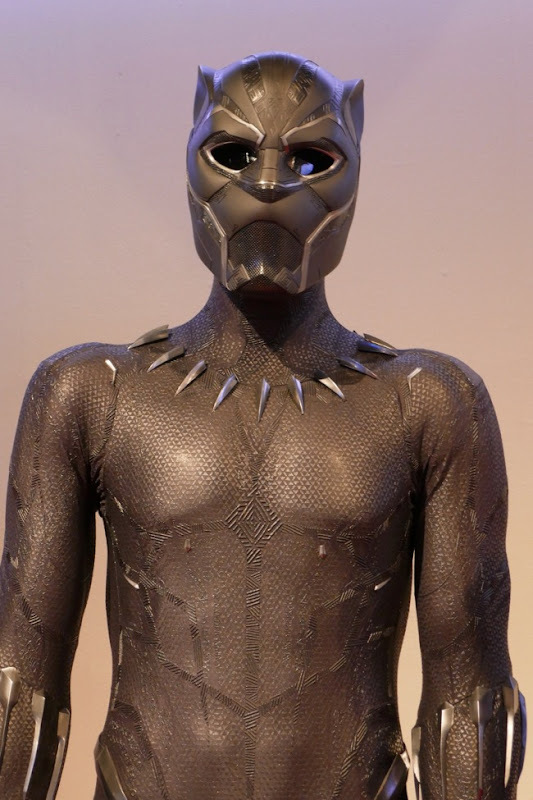 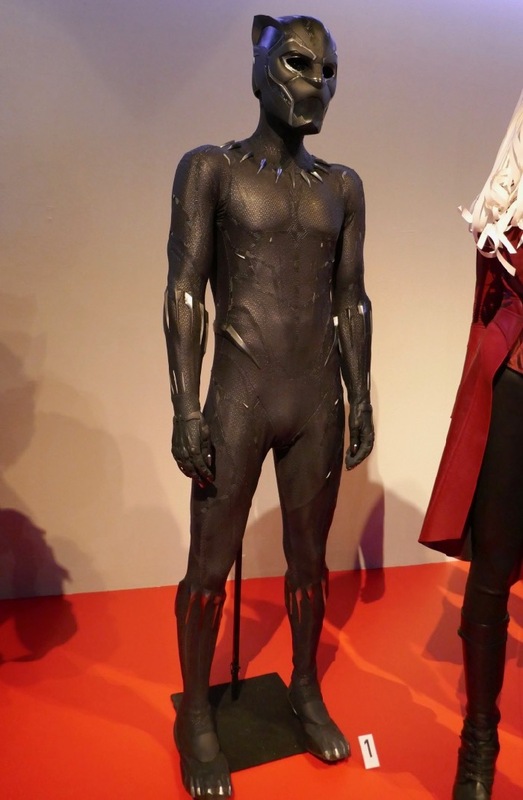 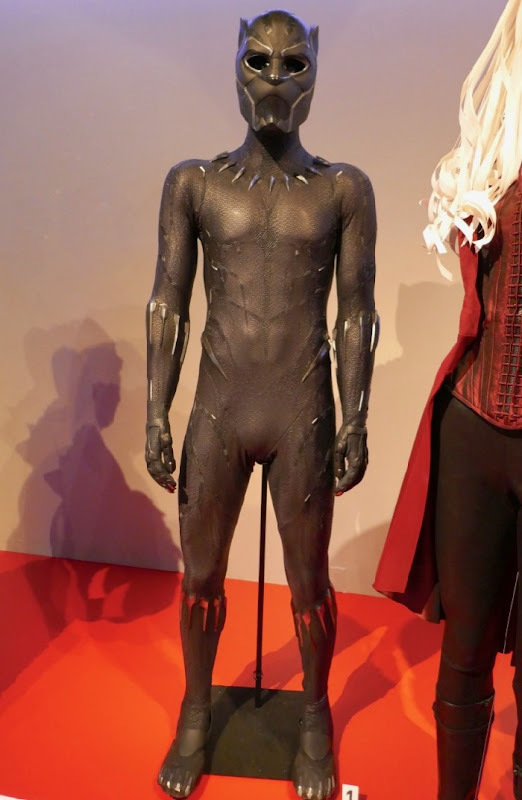 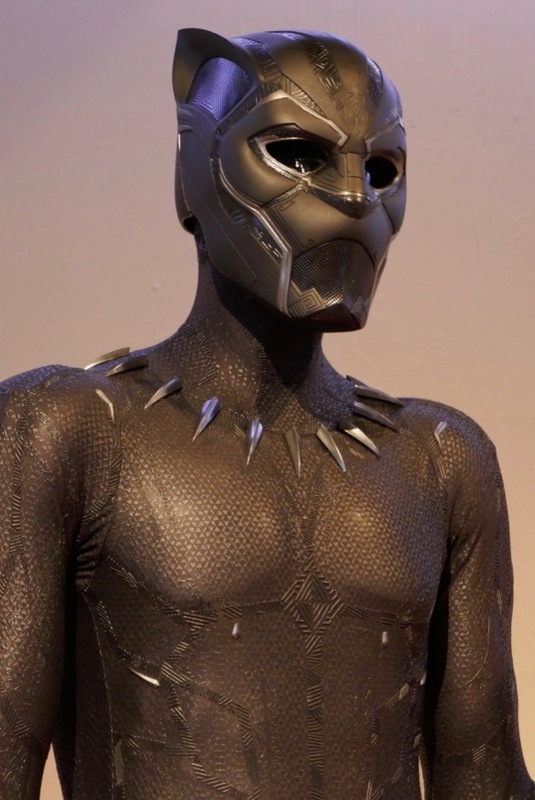 This is not the first time I've seen T'Challa's Vibranium-enhanced panther suit on display, and if you like this suit, check out his Black Panther costume from Captain America: Civil War and Killmonger's Golden Jaguar catsuit too. 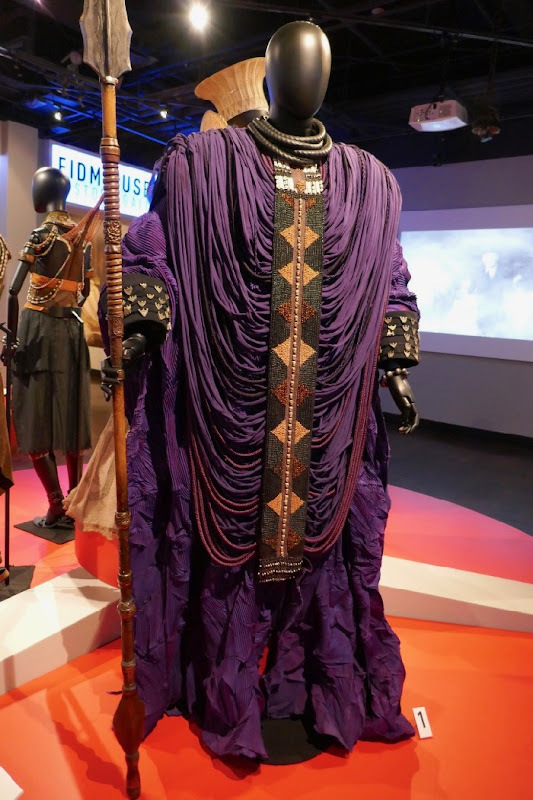 Forest Whitaker plays 'Zuri' and wears this purple ceremonial look as advisor to the king and guardian of the heart-shaped heart that gives the Black Panther his enhanced abilities of speed, strength and senses. 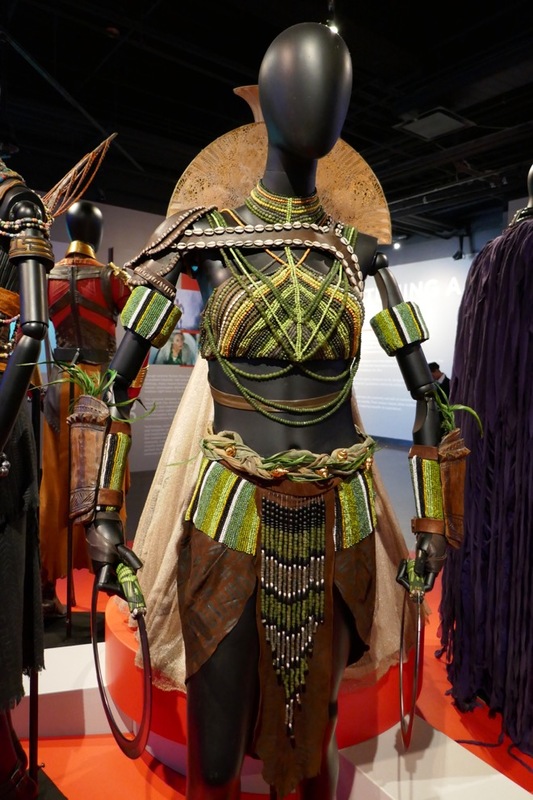 Lupita Nyong'o plays Wakandan 'War Dog' spy out in the world and fierce warrior 'Nakia', who is also the love of T'Challa. 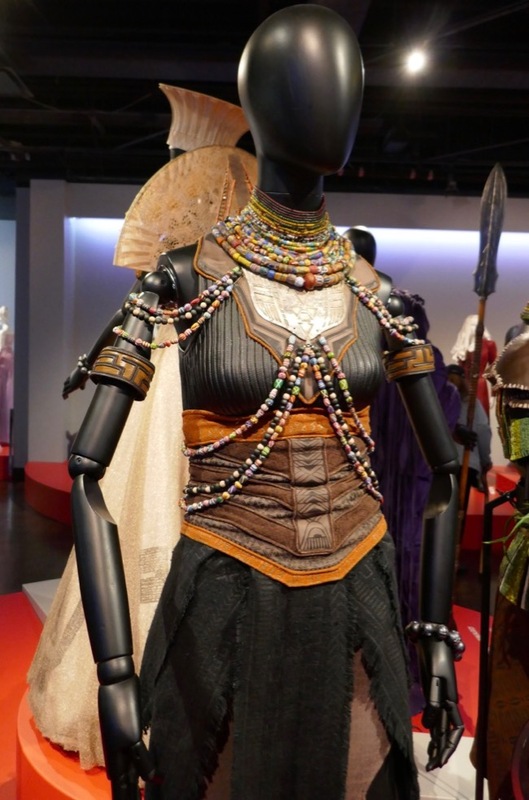 She wears this ceremonial costume to represents the River Tribe at T'Challa's Warrior Falls coronation. 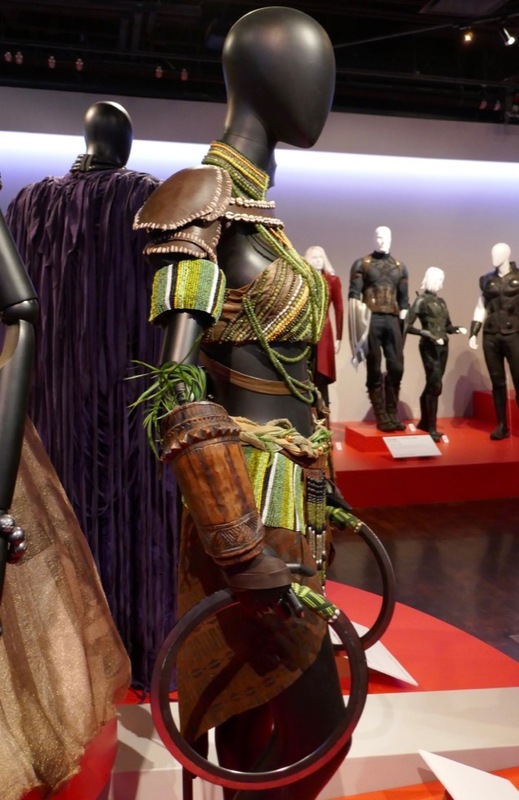 This talented spy sports a lot of green in her looks, so be sure to check out another Nakia costume on display. 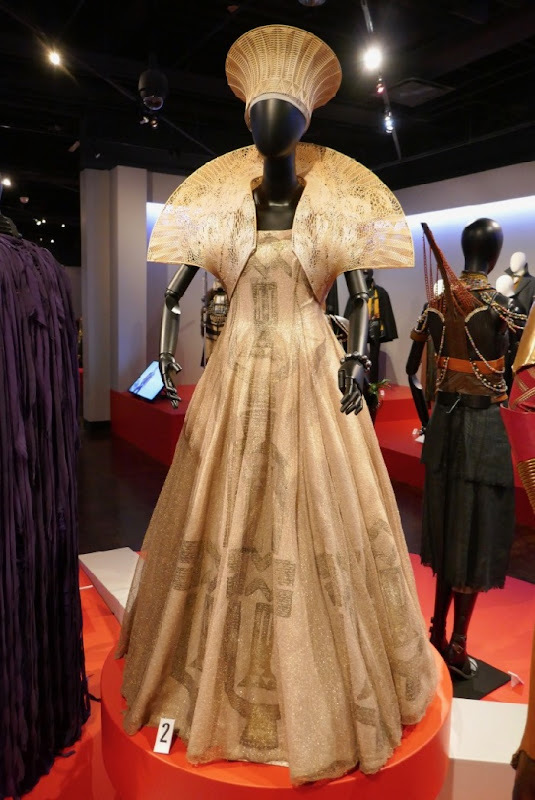 Angela Bassett stars as 'Queen Mother Ramonda' and wears this regal white ceremonial gown laced with metallic Vibranium. 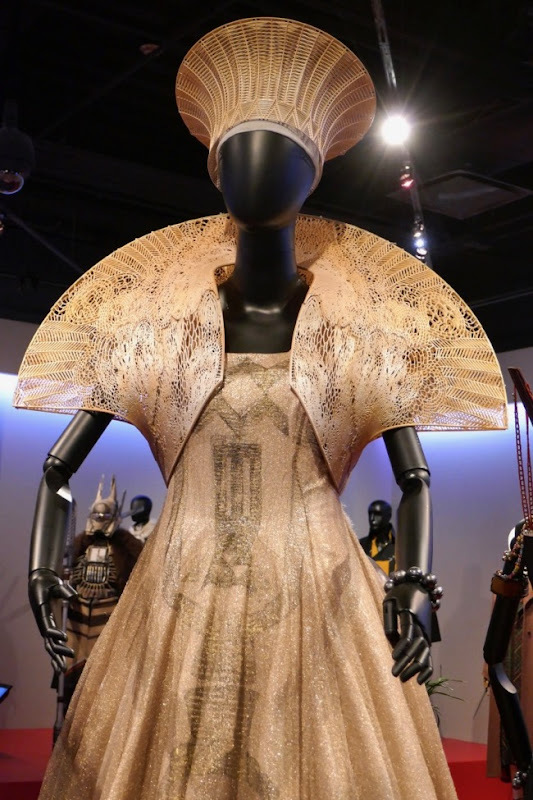 The look has a South African Zulu tribeswomen-inspired headdress and shoulder mantle based on African lace, inspired by English fashion designer Gareth Pugh and 3D printed by Julia Koerner. 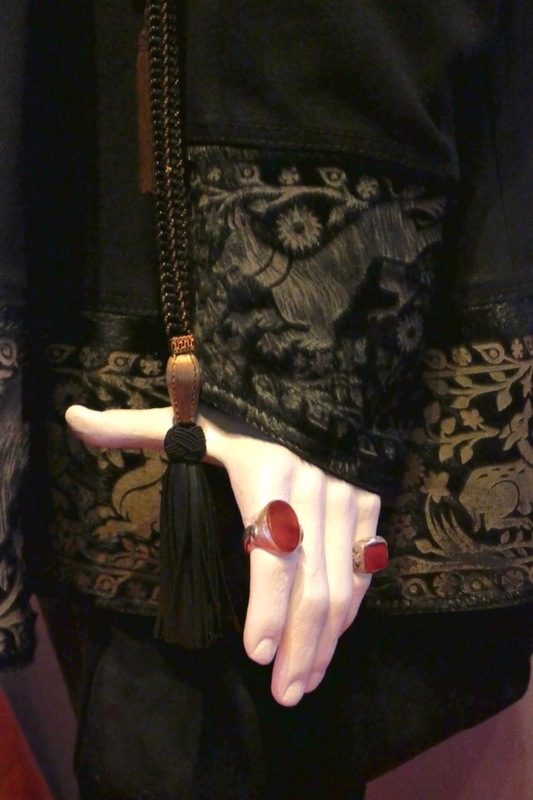 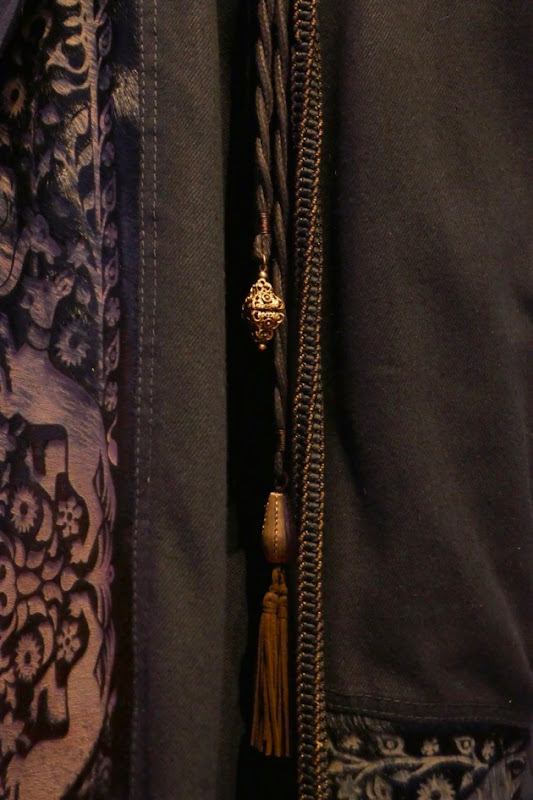 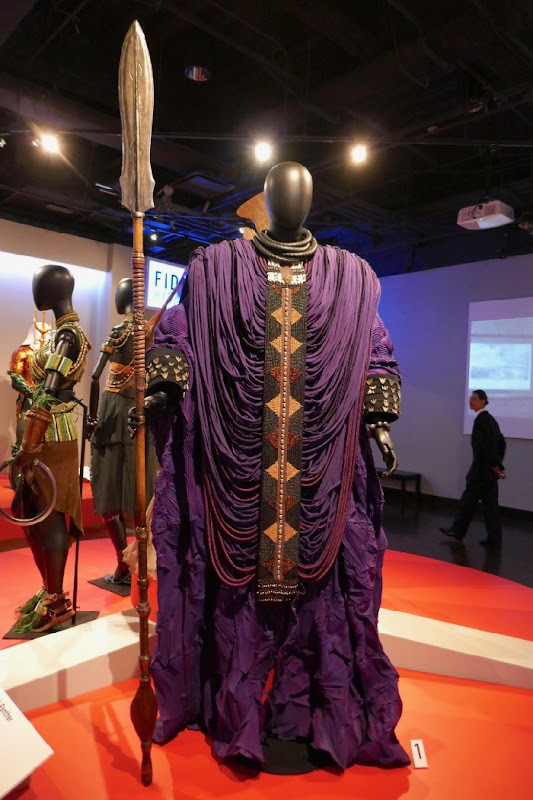 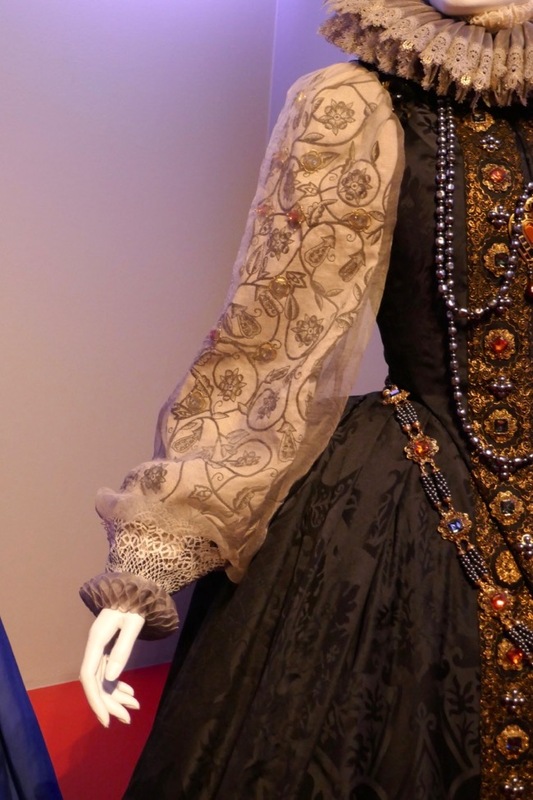 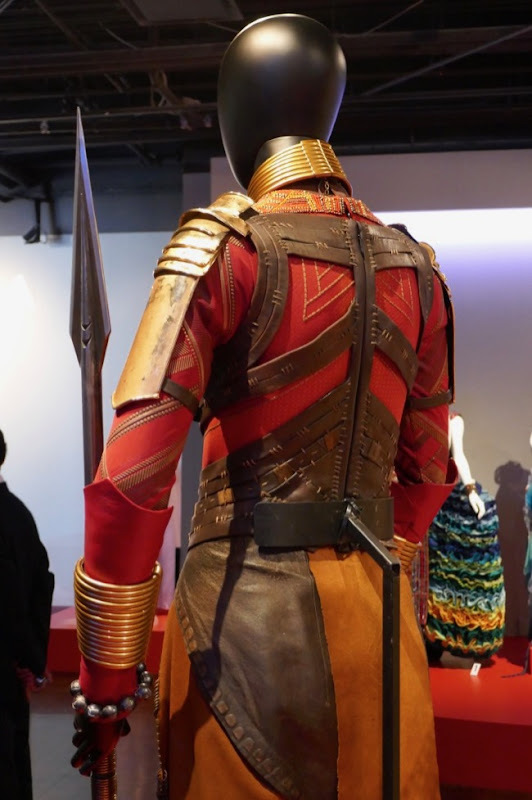 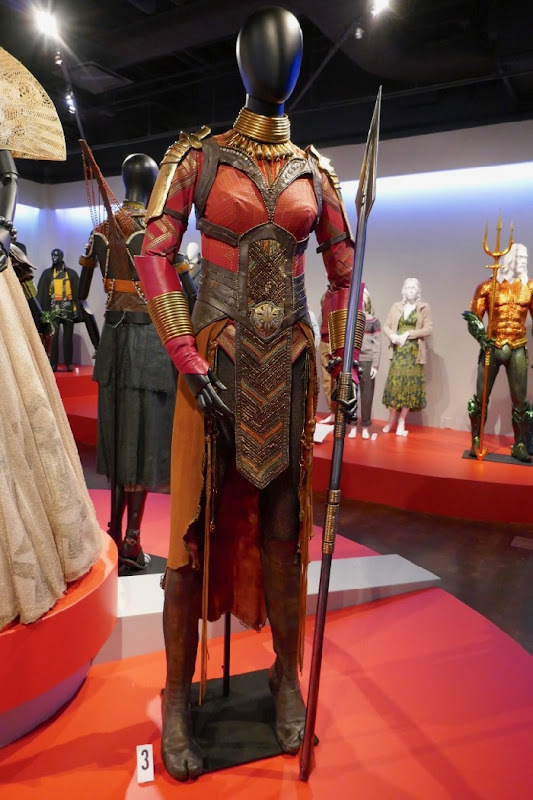 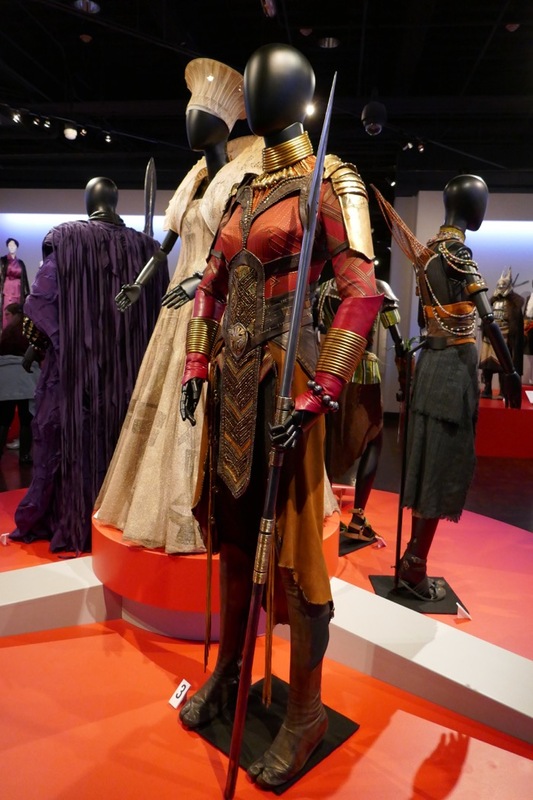 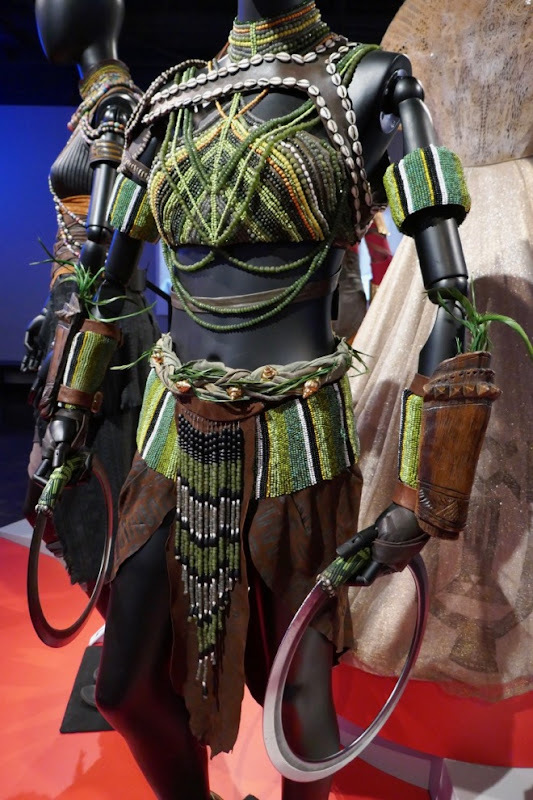 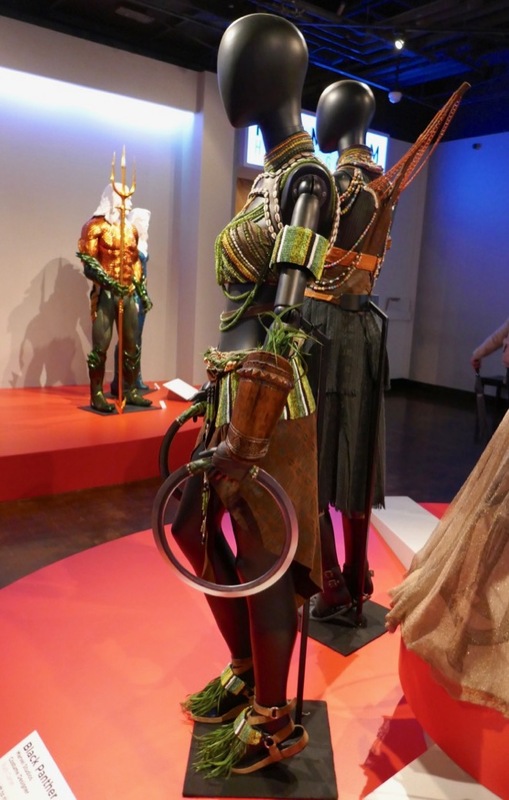 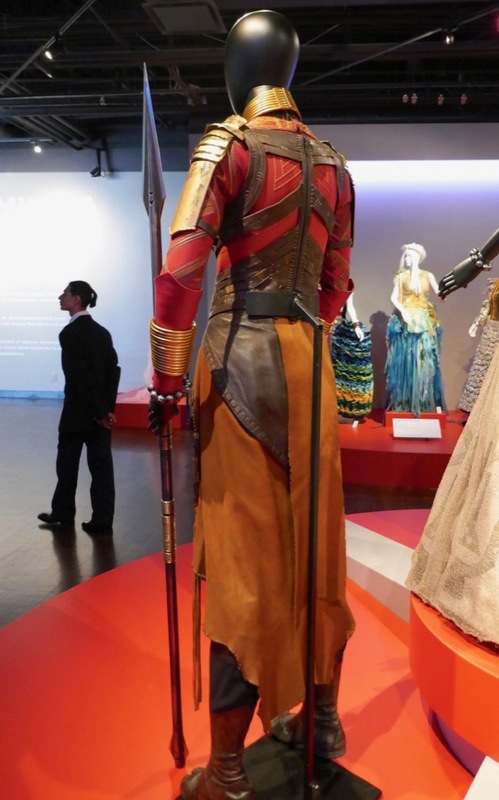 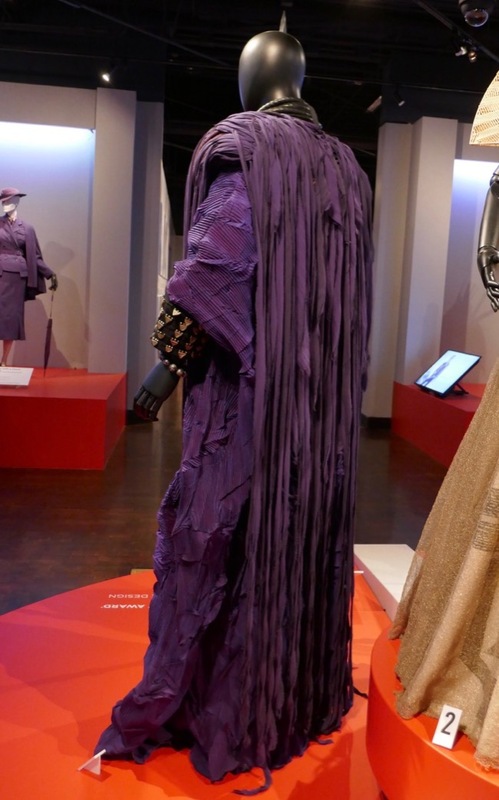 Make sure you also take a look at this other regal Ramonda movie costume on display. 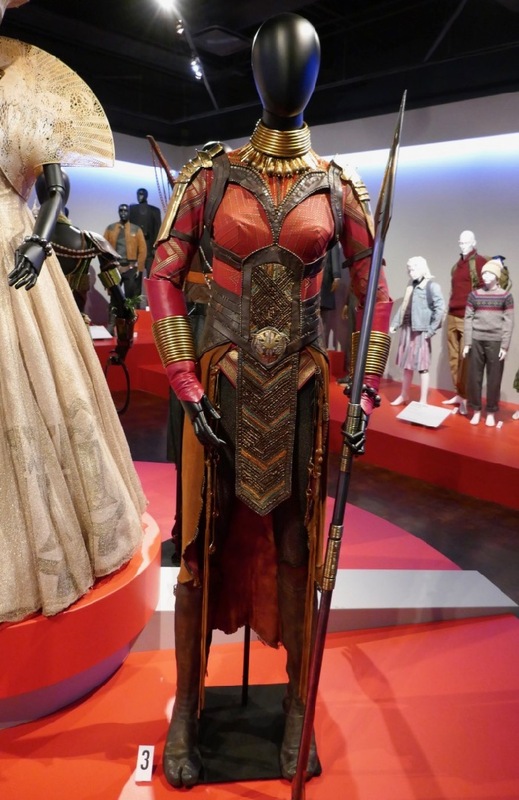 Danai Gurira plays 'General Okoye' of Wakanda's all-female Dora Milaje secret service and warrior women, who protect the nation's royal family. 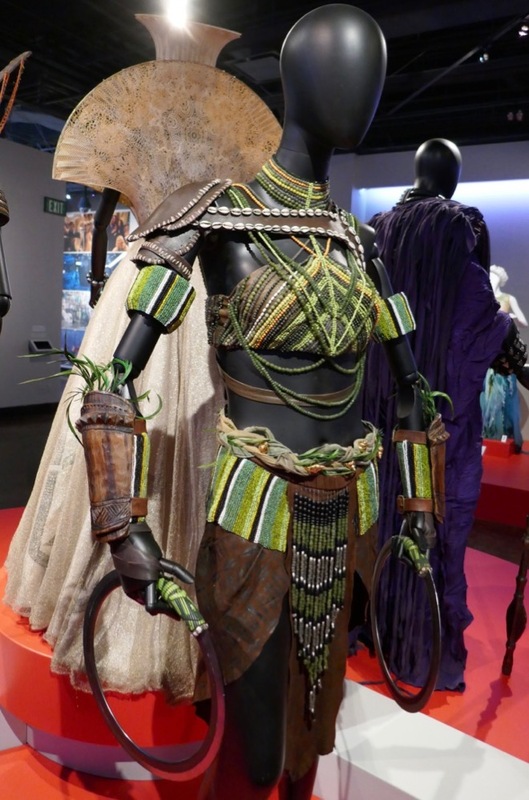 Letitia Wright plays T'Challa's genius younger sister 'Shuri' and wears this outfit for the Warrior Falls coronation ceremony. 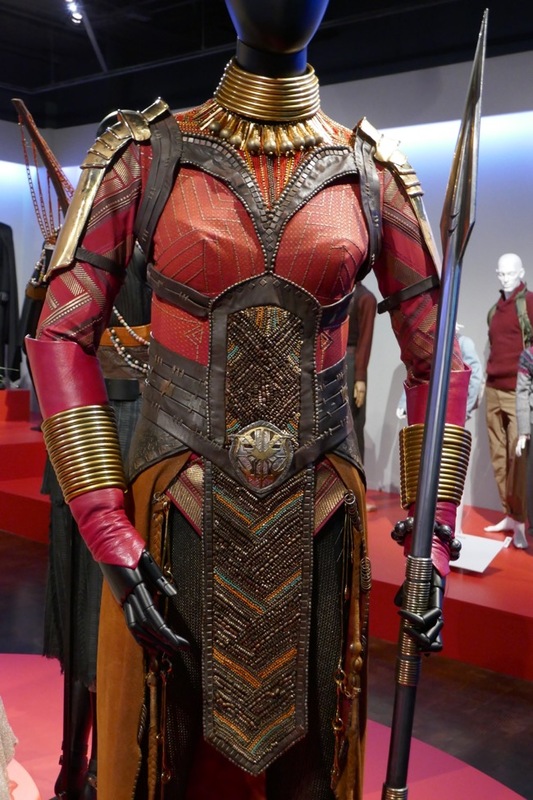 And if you like this look, be sure to also check out Shuri's warrior costume featuring her supercool panther gauntlets. 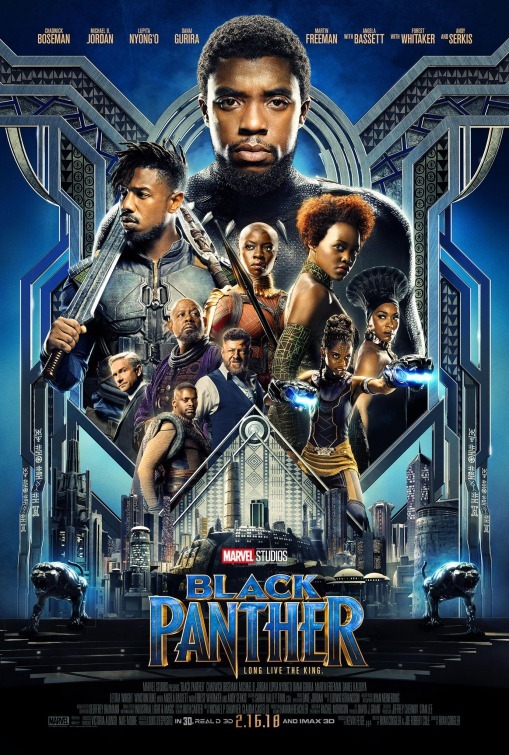 Overall Ryan Coogler's global box office smash won three Oscars out of seven nominations, including Best Costume Design, Best Production Design for another history-making African-American woman Hannah Beachler (along with Jay Hart) and Best Original Score for Ludwig Göransson. 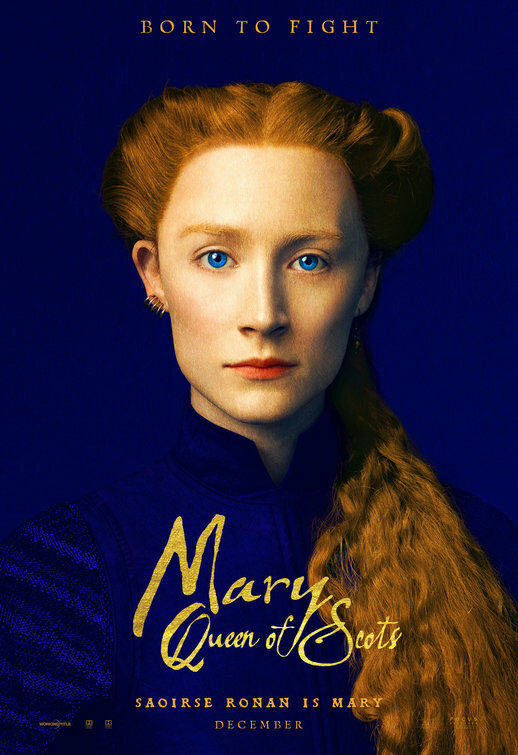 In Mary Queen of Scots based on John Guy's biography Queen of Scots: The True Life of Mary Stuart, the young Queen of Scotland (played by Saoirse Ronan) returns to her home country to claim the throne and finds herself in conflict with her English cousin 'Queen Elizabeth I' (Margot Robbie), her own Scottish family and the male patriarchy of the 16th century. 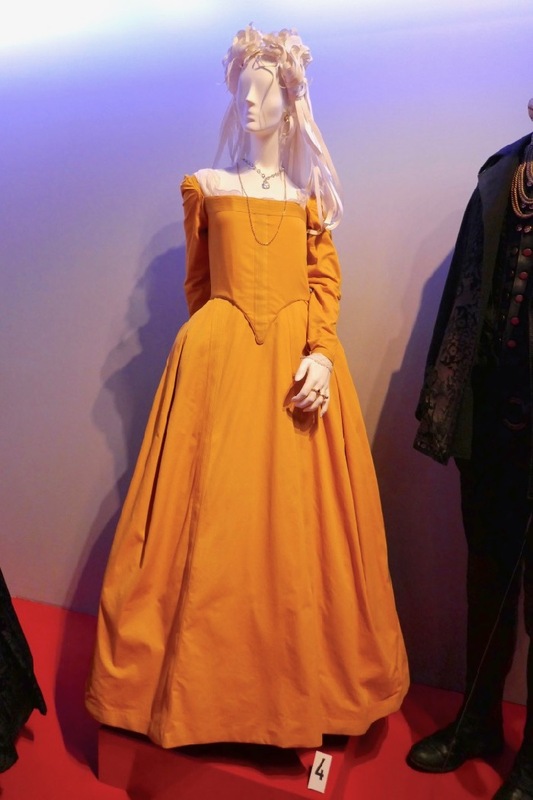 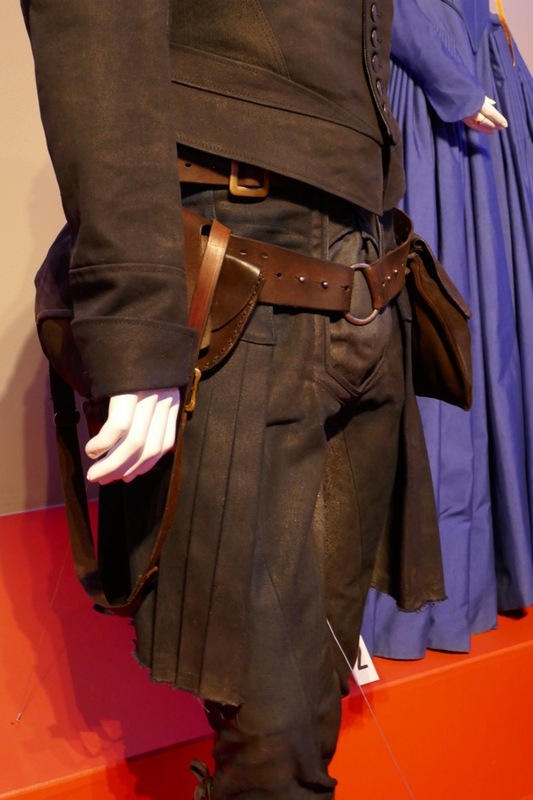 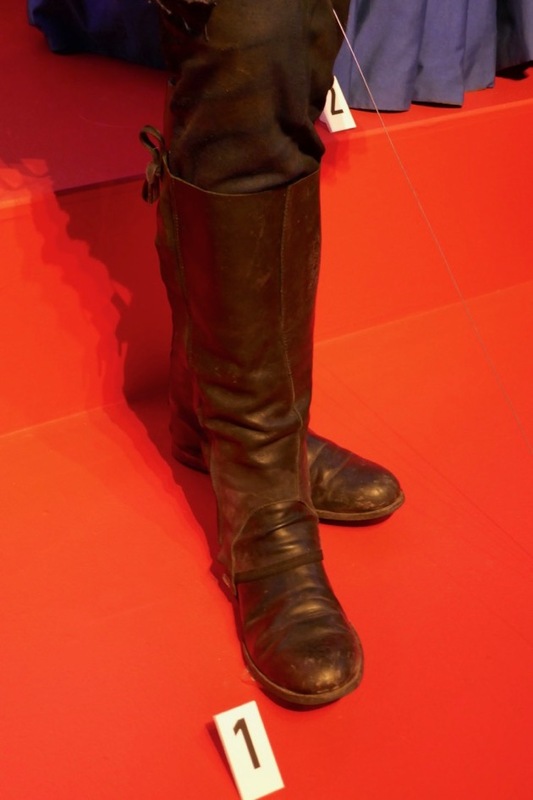 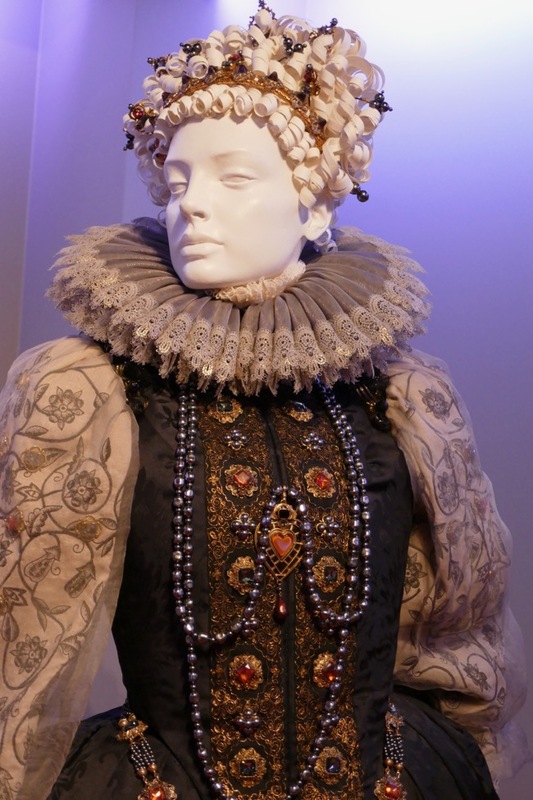 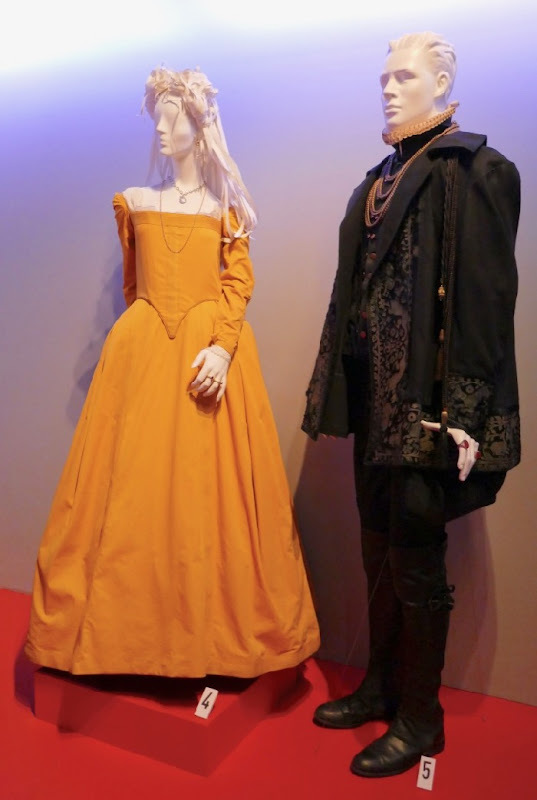 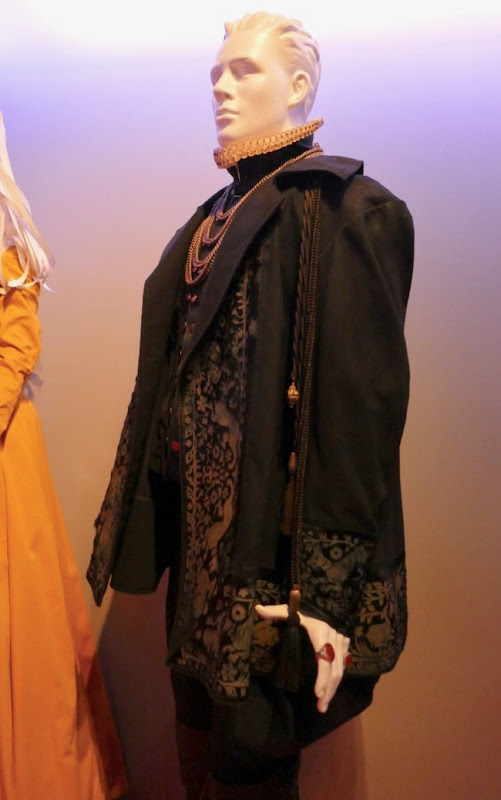 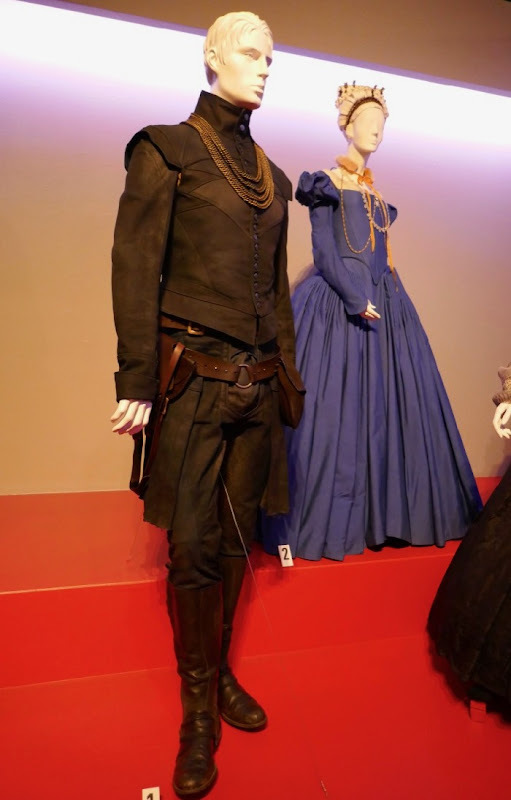 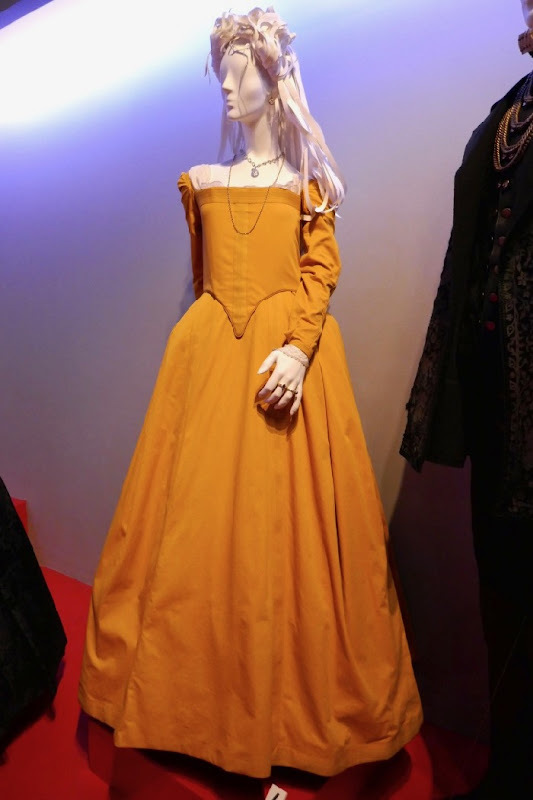 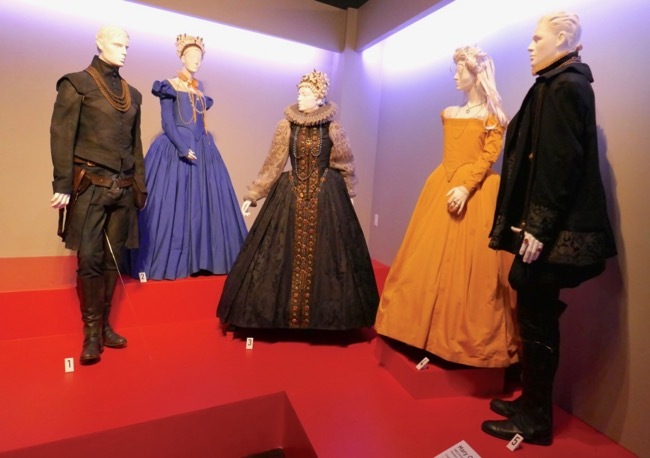 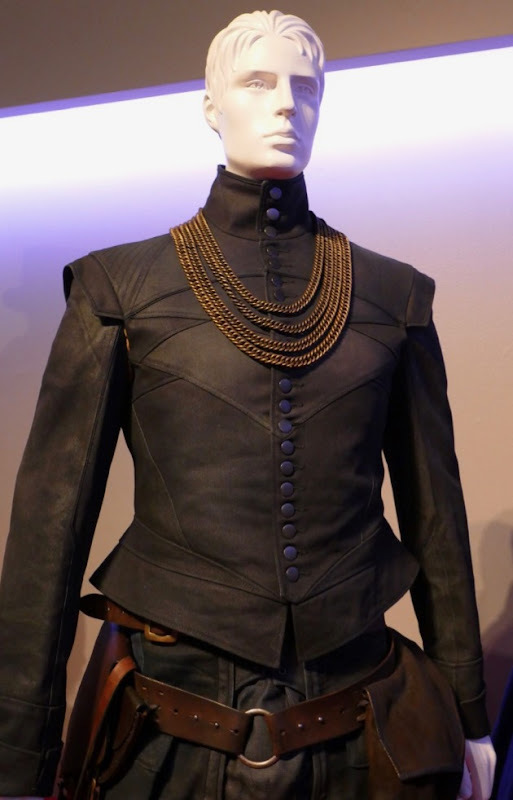 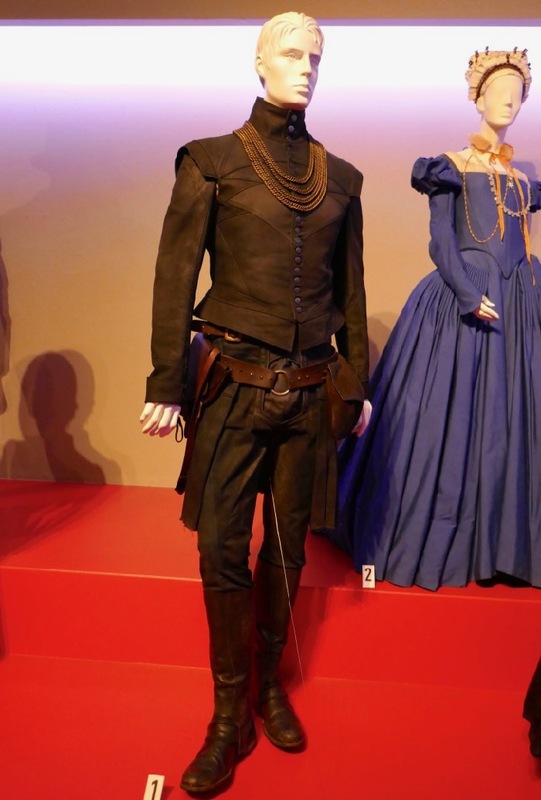 These Oscar-nominated costumes worn by Saoirse Ronan, Margot Robbie, James McArdle and Jack Lowden in Josie Rourke's film were photographed on display at Downtown L.A.'s FIDM Museum on February 5, 2019. 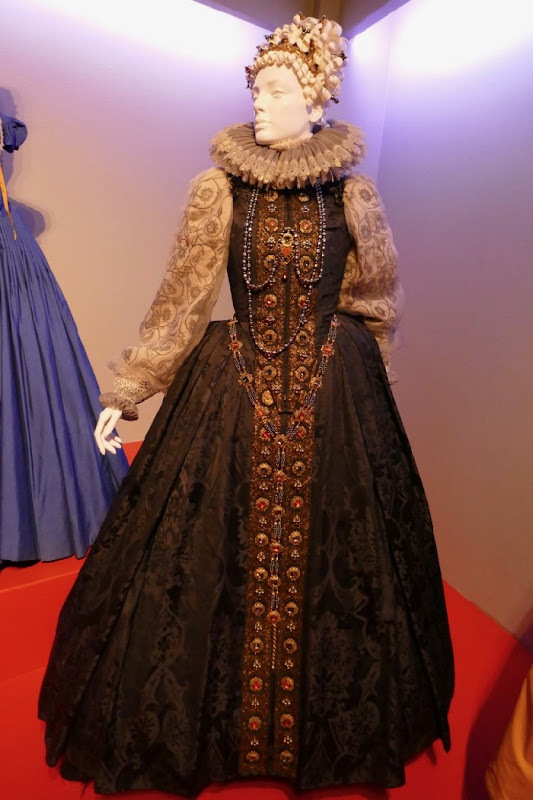 This is the fifth Oscar nomination for Best Costume Design for Alexandra Byrne, her first Academy Award win was for Elizabeth: The Golden Age in 2008. These gowns were worn by Saoirse Ronan as the 19-year-old Catholic Queen of Scotland and widow of Frances II of France, who returns to reclaim her rightful throne, and it's nice to see the looks complete with royal jewelry. 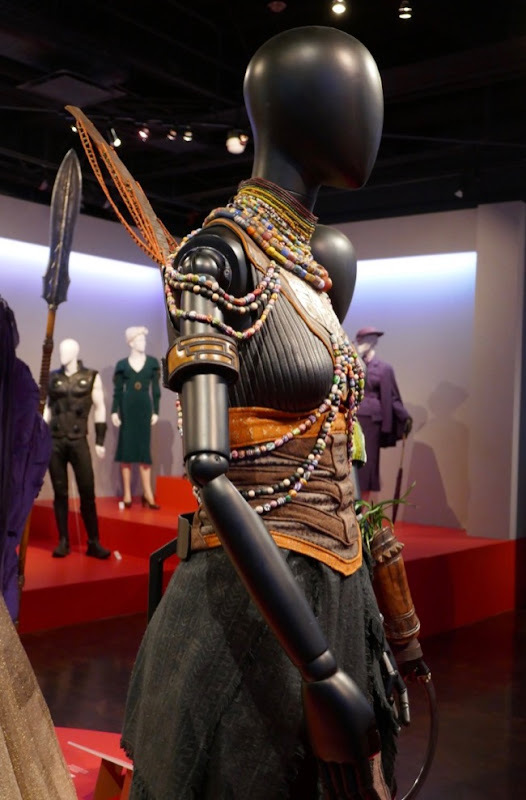 Fans of Saoirse Ronan can also enjoy these movie costumes from Lady Bird, these Brooklyn film costumes and these Hanna movie costumes. 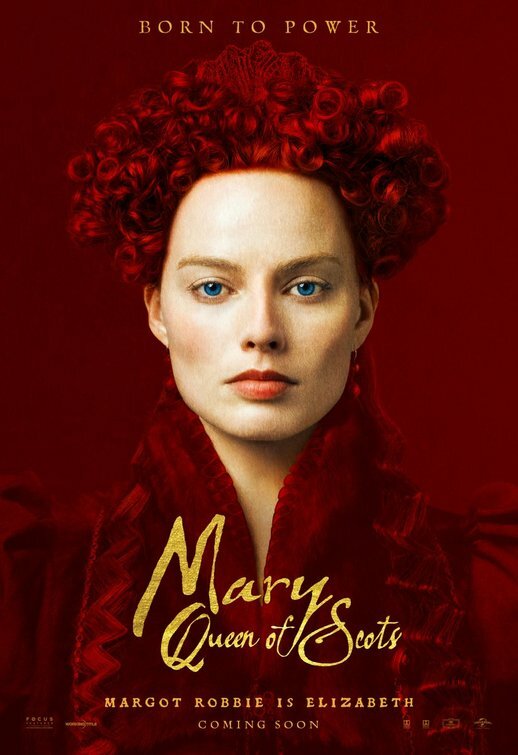 In the historical drama Margot Robbie plays 'Queen Elizabeth I', the Protestant Queen of England and Ireland and almost ten year older cousin of Mary. 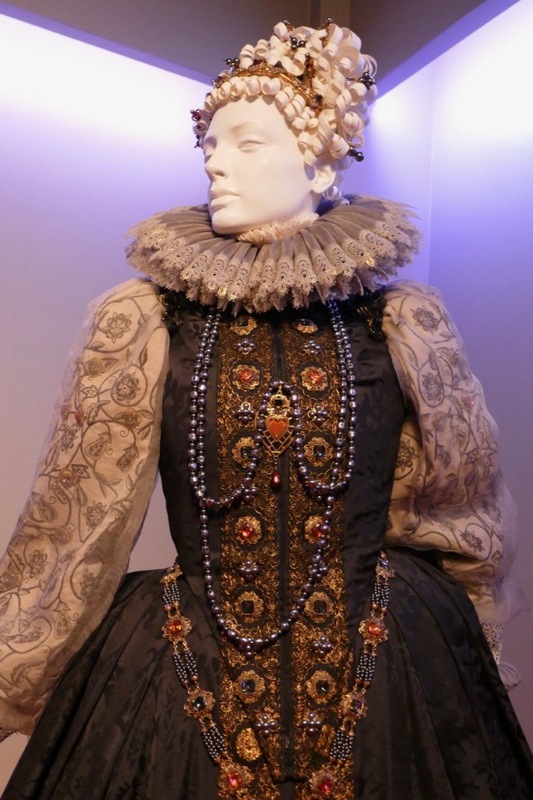 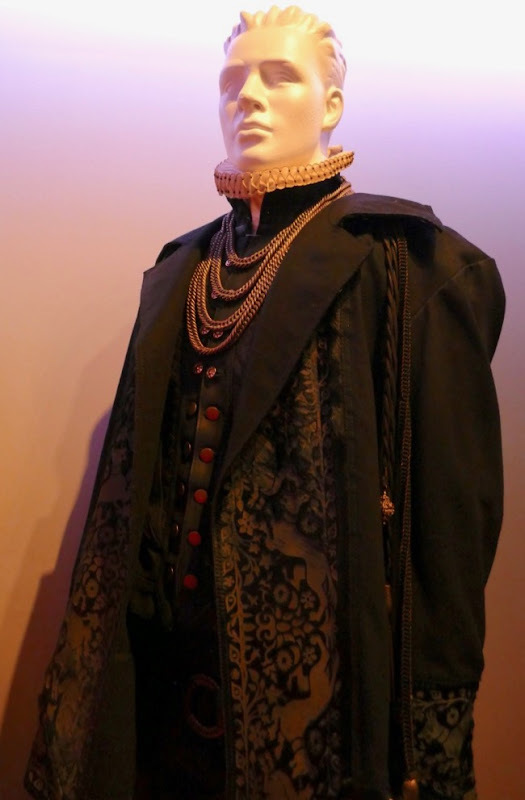 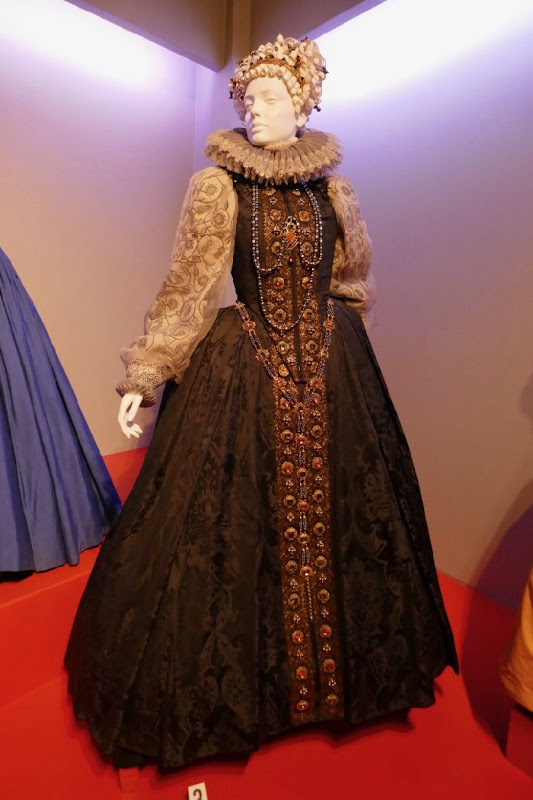 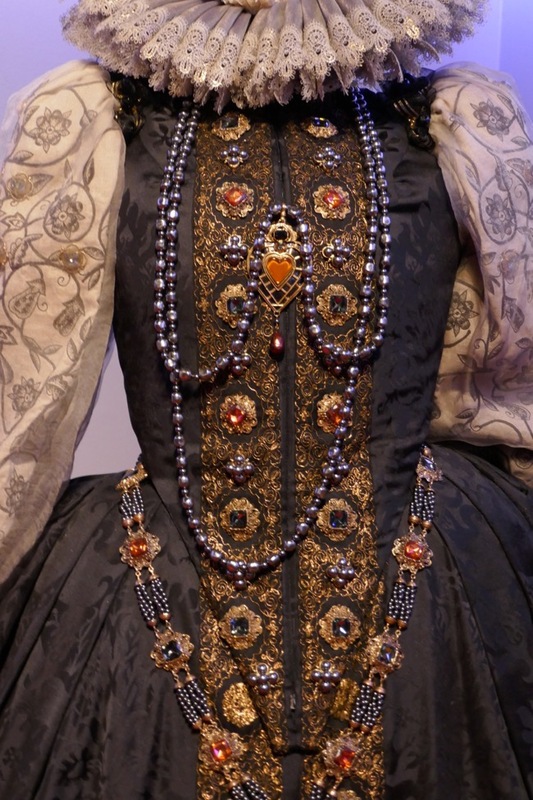 And if you like this regal look, be sure to check out this other costume worn by Margot Robbie in Mary Queen of Scots on display. 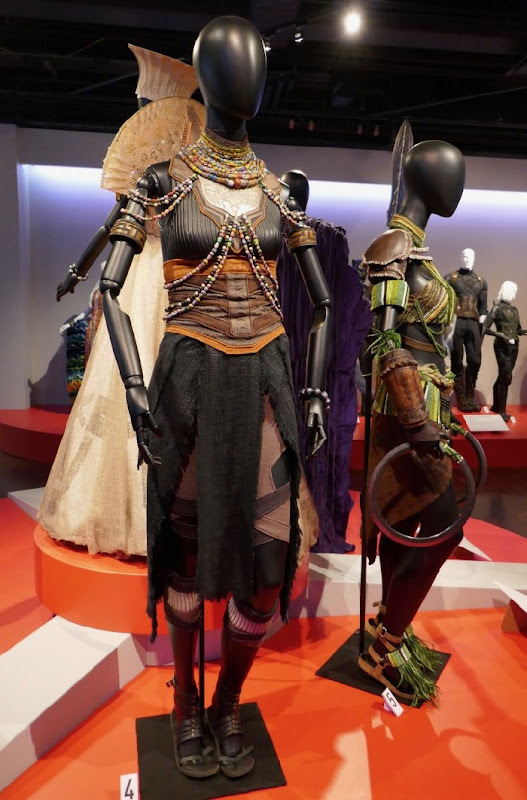 Plus Margot Robbie fans can also check out her I, Tonya movie costumes, her Harley Quinn costume from Suicide Squad and her film costume from Goodbye Christopher Robin. 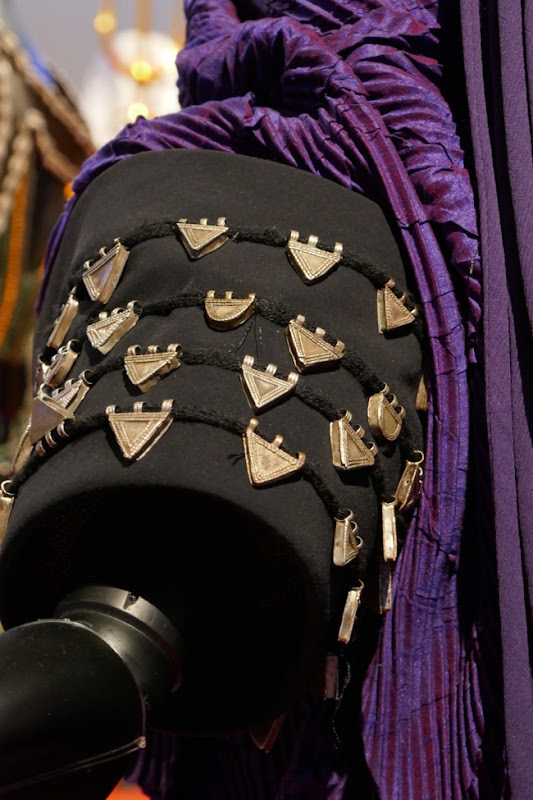 In the film James McArdle plays Mary's half brother 'James', the Earl of Moray and Regent of Scotland. 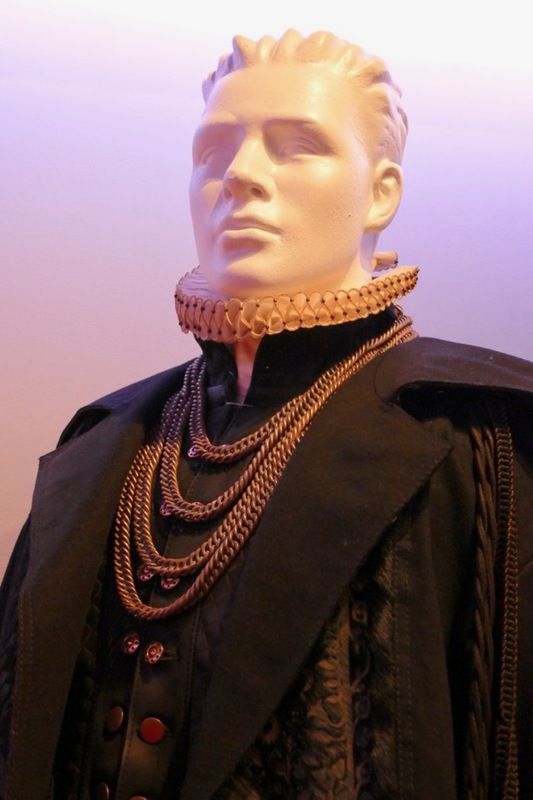 He tries to undermine Mary's claim to the throne. 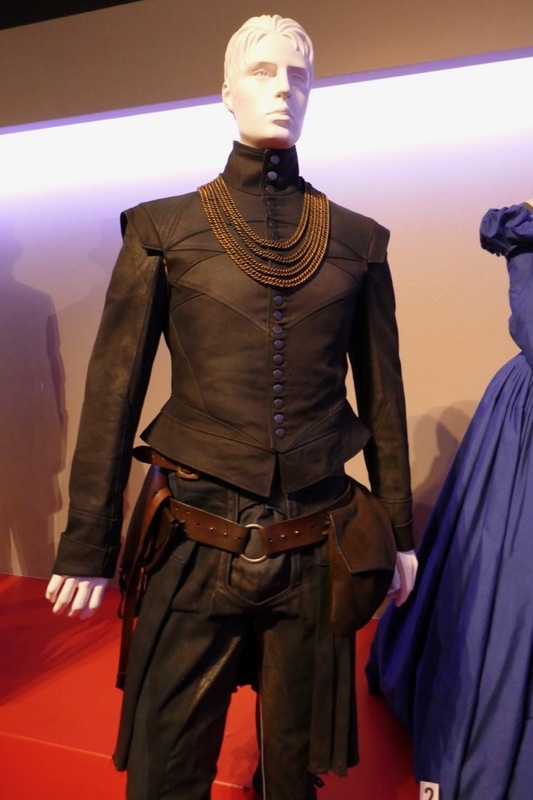 Jack Lowden plays English noble 'Henry Darnley' who becomes Mary's second husband and embarrasses her by getting drunk on their wedding day and bedding her Italian friend and cortier, 'David Rizzo'. 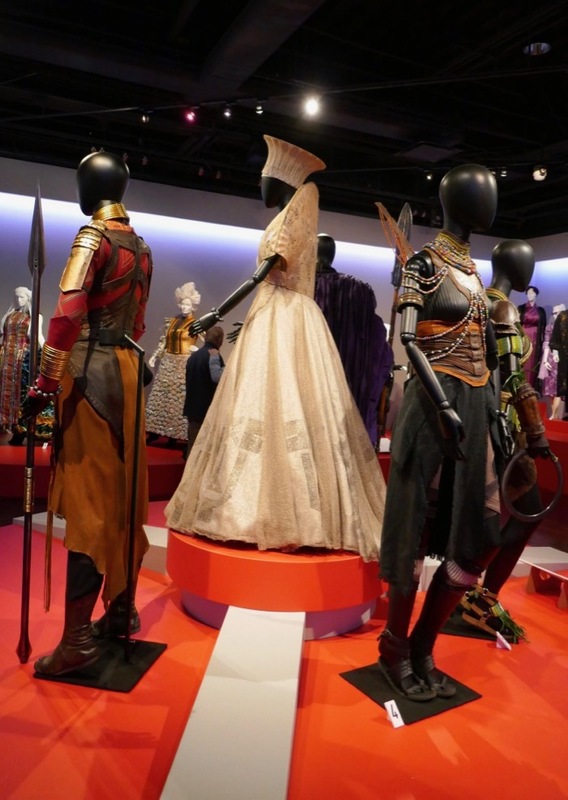 Let's see if Alexandra Byrne can take home her second Academy Award for Costume Design on Sunday February 24, 2019.